I did not grow up in a family of cooks. My favorite cooking memory with my grandma involved making pumpkin pie with the recipe from the back of the Libby’s can. She advised me to cut the spices in half. When I didn’t, she told me it was the best pumpkin pie she’d ever had and wondered what magical thing I had done. My mom, bless her, taught me how to cook and then promptly let me loose in the kitchen to continue making years of dinner onward, up until I moved away. Whenever I’m home for a visit, the status quo is accepted without question. 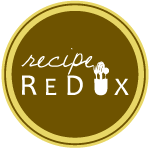 Perhaps out of survival, or because I’m an odd duck in this family of ranchers, I’ve been fascinated with food since before I was taught how to use a measuring cup. Knife skills were a self-educating adventure, and only when I come home am I reminded that I had no idea what I’d been missing out on all those years. Sharp knives have never had a place in my mom’s kitchen. I ventured to stock her kitchen with one or two nice knives a few years back, though they’ve not been sharpened since. The rest of the knife drawer includes a random collection that couldn’t have cost more than five bucks a piece. Now that I know the wonders of a good knife, I shudder at slicing and dicing in my mother’s kitchen. I am home with my parents and W for a few days, in between life ventures and to help celebrate my sister’s wedding. As much as I complain and paint an unfortunate picture, I love being home. I get to wake up to noise from family afoot. I get to sit in a sunny yellow room with windows on every wall, opening to a ranch scene of cows and pasture and rail fence and my favorite old barn, the one that is leaning a fair bit. I get to drink my tea in this room and enjoy breakfast with others. I can sit out on the front porch in the Adirondack chair and watch the day go by (more of the same scenery). I can do the same on the back patio. My favorite running route begins at this farmhouse. My old 4-H horse will run my direction for a rub when I call her from the edge of the pasture. I can bake sweets every day, knowing they won’t go to waste and I can start again with something new the next. I can be as adventurous as I like because if it has sugar in it, my dad will eat it. I can wander to the garden, and harvest what I want to eat. My mother is an avid gardener, and there is always fresh produce in this season. Perhaps in part because I steal rhubarb every time I visit in the spring, my mom planted several more plants. She is a veritable rhubarb farmer now, as there is an excess that only someone who loves to spend time in the kitchen can begin to use up. That’s what I’m here for. Chopping thick stalks of rhubarb with a dull knife. 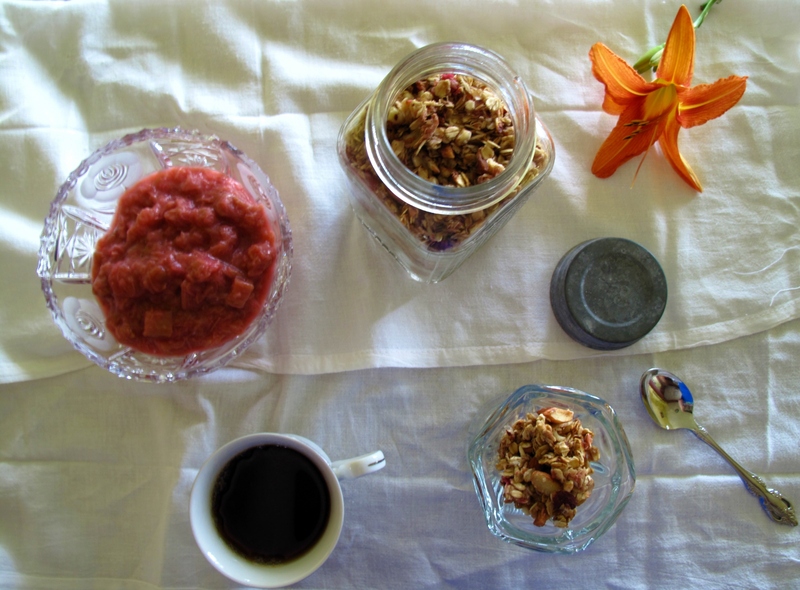 Making rhubarb sauce and rhubarb granola. 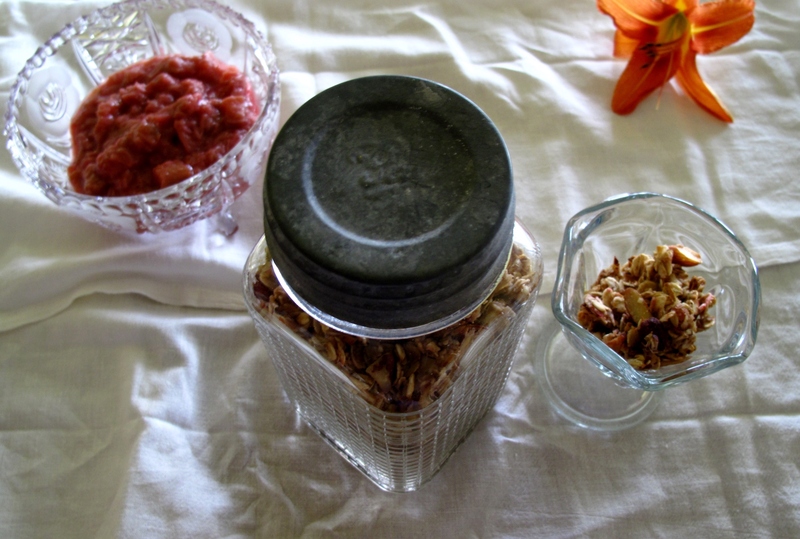 There is nothing I love more than rhubarb and oats. Except perhaps the rhubarb yogurt pairing found in Ireland. Make sauce with honey and orange and vanilla. I’ve been making it all spring and dishing it up atop anything and everything. I like my sauce a touch on the tart side, but add as much honey as you like. 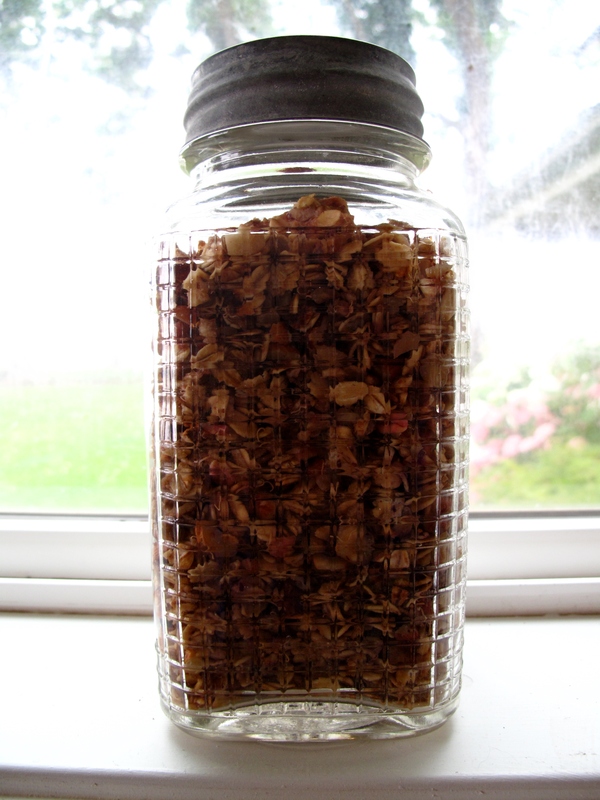 The sauce is perfectly poised to take part in this lovely crunchy, chunky granola, which come to think of it, I may or may not share, because my dad, who also loves rhubarb, will have gone before I can blink! 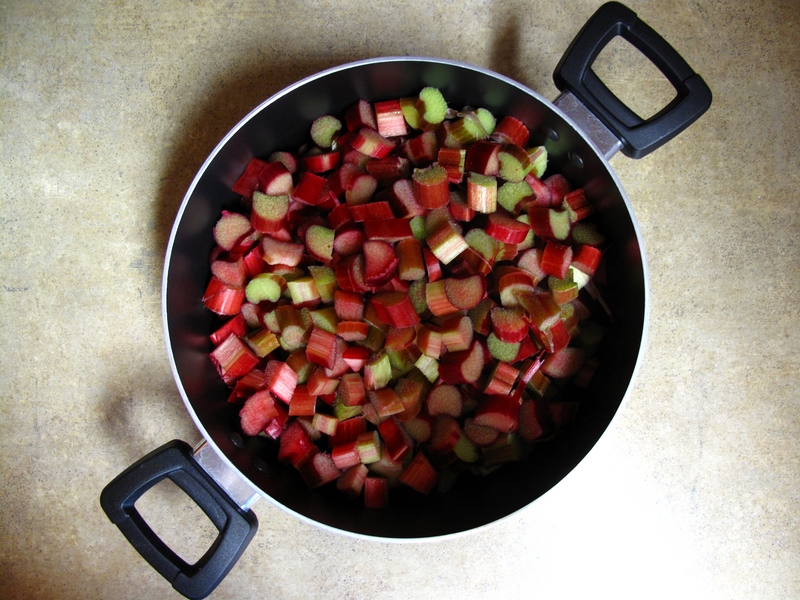 Chop rhubarb and throw in a large pot. Add honey, orange zest, vanilla, and a touch of water for moisture. 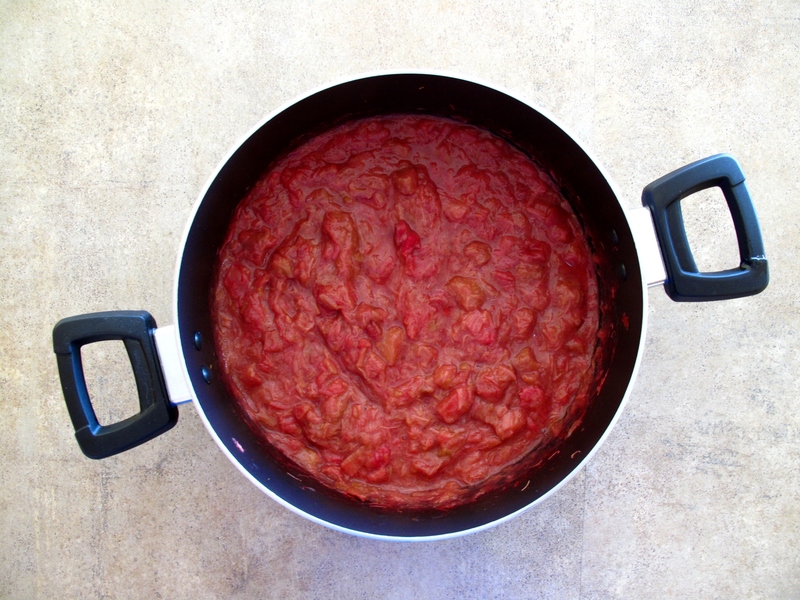 Bring to a low boil, and then simmer until the rhubarb has cooked down until thick and creamy. Take off the heat and let cool. Preheat oven to 350 degrees F. In a sauté pan, lightly toast almonds and Hazelnuts and then take off heat to cool slightly. 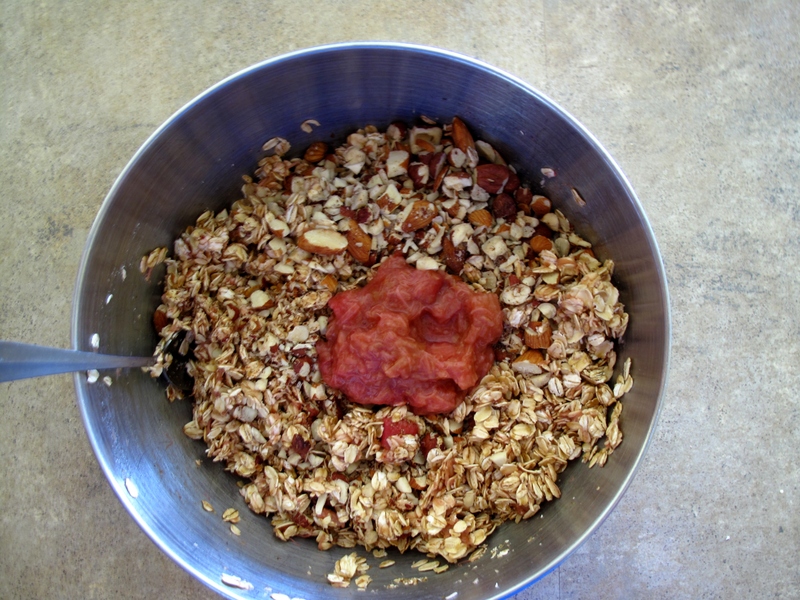 Measure out three cups oats and pour into a mixing bowl. Measure out vanilla, honey, oil and rhubarb sauce. Mix until combined and then pour into oats. Add toasted nuts and mix until combined. Add more sauce as needed until the mixture is at the desired consistency. 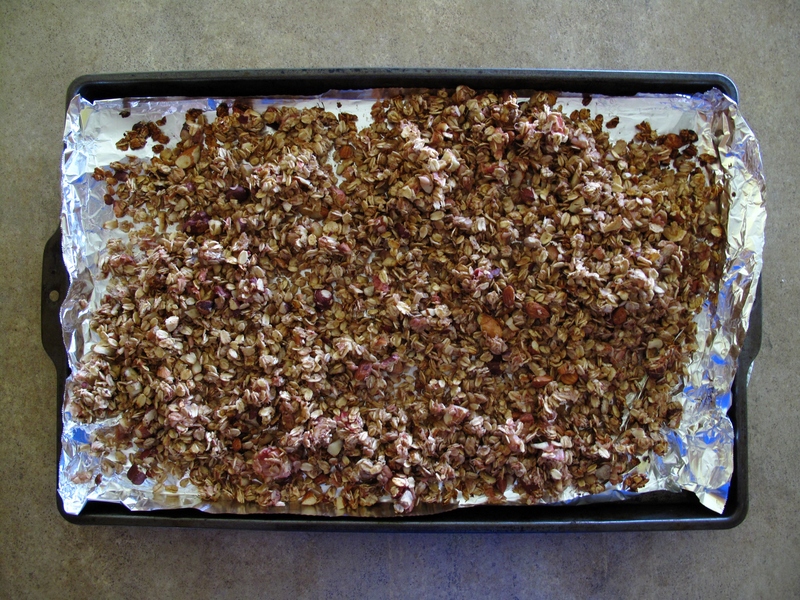 Spoon into a baking sheet and bake for about 15-20 minutes, stirring half way through.